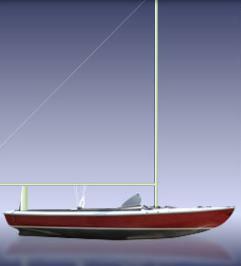 The Knockabout is a wonderful centerboard racing one-design that has stood the test of time moving from a wooden to a fiberglass hull. Her open cockpit allows plenty of room for crew work and sail handling. The Knockabouts shoal draft makes them ideal for shallow waters. Most of the racing fleets are located along Cape Cod, but Knockabouts are day sailed throughout the country. 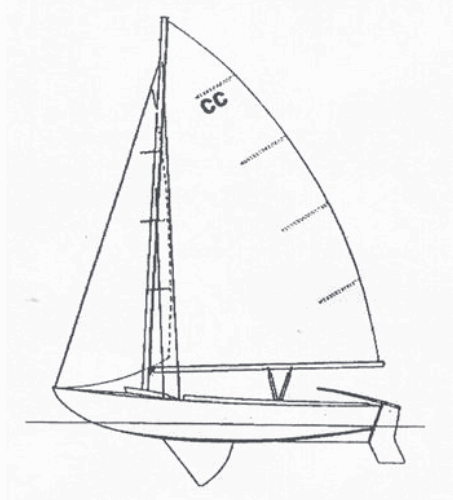 Knockabouts are built in much the same manner as she was in the past with foam floatation, loose lead ballast, and a red wood planked cockpit floor but today with a fiberglass hull and deck and aluminum spars. The rudder design has been improved in the transition and is now made of fiberglass as well. One can easily launch and rig the knockabout at a ramp. Main and Jib Sail Area 187 sq. ft.
Spinnaker Sail Area 150 sq. ft.